14 Jan 2011, Motorco Music Hall, Durham NC. 21 Jan 2011, The Earl, Atlanta GA. Thanks to Phil Venable for the setlist info. Bob and Dougie Arnott, Music House, Adelaide, South Australia, 13 Dec 2002. Bob and Danny Wallace, Music House, Adelaide, South Australia, 13 Dec 2002. Grant and Tim Peacock, DeBarra's Folk Club, Clonakilty, Ireland, 16 Dec 2012. 24 Dec 2012 Put up a performance stills page for the 17 Dec 2012 Grant Hart show at Cyprus Avenue, Cork, Ireland and added its link to the dates page. Thanks to photographer Caroline Kennedy. 24 Dec 2012 Put up a performance stills page for the 16 Dec 2012 Grant Hart show at DeBarra's Folk Club, Clonakilty, Ireland and added its link to the dates page. Thanks to Tim Peacock and photographer Kate Fox of whisperinandhollerin.com for the images. 24 Dec 2012 Put up a poster image for the Bob Mould Band dates at Bowery Ballroom, NYC, 26-27 Feb 2013 and updated the 2013 flyer index page. 23 Dec 2012 Put up a venue image page for the site of the former Studio D in Dallas, where Hüsker Dü played a couple of gigs in late 1982-early 1983. 20 Dec 2012 Added Grant Hart's recently-announced 12 Jan 2013 gig at the Red Line Tap in Chicago to the dates page, put up a poster image for it, and updated the 2013 flyer index page. More info on the show here. Thanks to Rüdiger Höckel for the heads-up. 16 Dec 2012 Put up a poster image for Grant Hart's 13 Dec 2012 gig at Bourke's (Limerick, Ireland) and another showing all four Irish tour dates. Updated the dates page and the 2012 flyer index page. Thanks to Colm O'Herlihy. 16 Dec 2012 Put up a setlist page for Grant Hart's 14 Dec 2012 full-band gig at Whelan's in Dublin. Thanks to Sumant Ranji and Brigid McGough. 15 Dec 2012 Updated the dates page to reflect a venue switch of the 15 Dec 1992 Sugar gig from Manchester University Union to the Academy next door. Thanks to Dave Thompson for the info. 13 Dec 2012 Put up a performance stills page for the 13 Dec 2002 Bob Mould show at Music House, Adelaide, South Australia and added its link to the dates page. 07 Dec 2012 Updated the annotated discography entry for Grant Hart's upcoming double album, The Argument, and added any previously unlisted song titles to the Hüsker Dü song titles page. 07 Dec 2012 New Grant Hart date announced: record release/listening party for The Argument, including live performance. Updated the dates page and put up an image of the event flyer. 06 Dec 2012 Updated the venue description page for the long-defunct Headliners in Madison (WI) and put up a venue image page for its former site, still in use as a pub and liquor store. 02 Dec 2012 Put up a venue description page and a venue image page for Liberty Lunch in Austin (closed since 1999) and replaced the long-dead links on the dates page. 25 Nov 2012 Added Greg Norton's 23 Nov 2012 guest appearance with Pink Mink at 1st Ave (Replacements tribute/benefit concert for Slim Dunlap) to the dates page; put up a setlist page and a performance stills page. Thanks to Geoff Greenberg and Tobi Severson. 24 Nov 2012 Fixed the link to the Rose Club (Köln) on the dates page and put up a venue image page. 23 Nov 2012 Put up a venue description page and a venue image page for The London Astoria Theatre (demolished in 2009) and replaced the dead links on the dates page. 22 Nov 2012 Put up a venue image page for Leeds University Union and added its link to the dates page. 21 Nov 2012 Added a ticket image for the 18 Mar 1986 Hüsker Dü show at Leeds University (UK) to the ticket collage page. 21 Nov 2012 Added a flyer image for the Bob Mould Band 19 Seo 2012 show at Wonder Ballroom in Portland OR and updated the 2012 flyer index page. 18 Nov 2012 Uploaded and embedded a YouTube video in the Live TV section of the annotated discography for MTV 120 Minutes, 18 Nov 1990, which featured Bob Mould interviewed by Dave Kendall along with promo videos for "It's Too Late" and "See A Little Light." Because the inclusion of the promo vids causes the YouTube video to be blocked in some countries, an edited version has been made available here. 15 Nov 2012 Uploaded and embedded a YouTube video in the Live TV section of the annotated discography for VH1 Top 100 Artists Of Hard Rock (Hüsker Dü #68). The program initially aired 15 Nov 2000. 24 Oct 2012 The on-again/off-again Bob Mould Band 2013 Australia tour is back on again! Updated the dates page. Information supplied via the promotional tour video. Thanks to Phil Venable for the pointer. 18 Oct 2012 Updated the dates page to reflect the unfortunate cancellation of the Bob Mould 2013 Australia tour. More info here. Also put up an image of the generic 2013 Australia tour poster and created a 2013 flyer index page. 03 Oct 2012 Upgraded the artwork page for the Tellus #1: All Guitars! cassette magazine, featuring Bob Mould's improvisational guitar piece during a Hüsker Dü soundcheck at an unspecified venue in the mid-80s. 03 Oct 2012 Put up what is now believed to be a complete setlist for the 18 May 1993 Sugar gig at Oz, Seattle. Also added an entry to the live audio section of the annnotated discography for the recently-surfaced recording on which the setlist was based. Thanks to Rüdiger Höckel and Opu Anwar for the info. 18 Sep 2012, Showbox, Seattle. 19 Sep 2012, Wonder Ballroom, Portland OR. 21 Sep 2012, Fillmore, San Francisco. Thanks to Jason Narducy (Seattle, Portland) and Sumant Ranji (SF). Thanks to Peter Whitfield for the SF photos and Andy Nystrom (There's Something Hard in There) for the Seattle photos. Thanks to Tony Patino for sending the link to his Greg Norton video interview. 08 Sep 2012, 9:30 Club, Washington DC. 13 Sep 2012, Metro, Chicago. 14 Sep 2012, Metro, Chicago. 15 Sep 2012, 1st Ave, Minneapolis. 07 Sep 2012, Williamsburg Park, Brooklyn. 10 Sep 2012, Paradise, Boston. Thanks to John Hogan for the Brooklyn setlist. 04 Sep 2012 Upgraded the artwork page for Sugar's Copper Blue album released in the US 20 years ago today. 28 Aug 2012 Put up a venue image page for Mohawk, Austin TX. Thanks to Les Ridingin for the photo. 28 Aug 2012 New Grant Hart date disclosed: 01 Sep 2012, Record Bar, Kansas City. More info here. Thanks to Rüdiger Höckel for the pointer. 01 Nov 2012, Slim's Downtown, Raleigh NC. Also put up a venue image page for Slim's. Thanks to Rüdiger Höckel for the pointer. 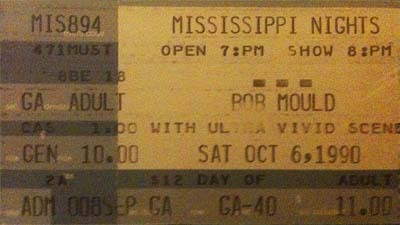 22 Aug 2012 Added a ticket image for the 06 Oct 1990 Bob Mould show at Mississippi Nights in St Louis to the ticket collage page. Thanks to Roy Christian. 22 Aug 2012 New Grant Hart date disclosed: 02 Nov 2012, 529 EAV, Atlanta. More info here. Thanks to Piet van Bossuyt for the Brussels ticket image. 16 Jun 2012 The 07 Sep 2012 Bob Mould Band Copper Blue show has been moved to Williamsburg Park, Brooklyn (free admission). More info here. Added a venue description page and a venue image page for Williamsburg Park, and updated the dates page. 08 Jun 2012 New Grant Hart date announced: 14 Jul 2012, Patrick's Cabaret, Minneapolis (Twin Cities. Roots, Rock and Deep Blues Music Festival). More info here. Also put up a flyer image for the event and updated the 2012 flyer index page. Thanks to Paula Warner for the pointer. 07 Jun 2012 Updated the setlist page for Bob Mould's 09 Feb 2012 show at City Winery with corrected song titles, based on the recently-published track list for his upcoming Silver Age album. If anyone cares, "...old refrain" appears to be "First Time Joy" and "...rearrange" appears to be "Angels Rearrange." 06 Jun 2012 Updated the annotated discography entry Bob Mould's upcoming album, now known to be titled Silver Age. Projected release date is 04 Sep 2012. Also updated the summary discography and added the new track titles to the song titles page. Updated the dates page and the candid photos index page. Thanks to Jason Narducy for the info. 31 May 2012 Put up a setlist page for Bob Mould's solo electric instore performance earlier today at Rough Trade East Records in London. Thanks to Al Millington for the info. Also updated the 1981, 1983, and 2011 flyer index pages. 28 May 2012 New Grant Hart date announced: 03 Jun 2012, Haw River Ballroom, Saxapahaw NC. Benefit concert for the wife and children of Matt Brown, drummer for the Venables, Two-Dollar Pistols, and other bands, who died unexpectedly earlier this month. Also featuring the aforementioned bands and numerous others. More info here. Also put up a flyer image for the event and updated the 2012 flyer index page. Thanks to Phil Venable for the pointer. 26 May 2012 Uploaded video to YouTube of Bob Mould's 26 May 1996 appearance on MTV 120 Minutes and embedded it in the annotated discography entry for that program. Bob Mould + The Last Dog And Pony Show. 18 May 2012 Added an entry to the annotated discography for the If I Can't Change Your Mind UK Record Store Day limited edition 7" and put up an artwork page for it. Also updated the summary discography. 15 May 2012 Another Bob Mould Band festival date announced: DeLuna Fest, Pensacola Beach FL, 21-23 Sep 2012. Ticket info here. 14 May 2012 Another new Grant Hart date discovered: 16 May 2012, Record Bar, Kansas City. More info here. Thanks to Paula Warner for the pointer. 14 May 2012 New Grant Hart date announced: 17 May 2012, Eighth Street Taproom, Lawrence KS. More info here. Thanks to Paula Warner for the pointer. 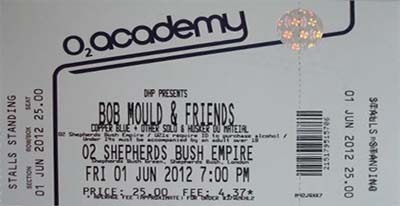 11 May 2012 New Bob Mould date announced: 31 May 2012, Rough Trade East, London (midday instore performance). More info here. Thanks to Al Millington for the pointer. Also noted that the previously announced 14 Aug 2012 Copper Blue date at Arena Wien in Vienna has been canceled. Bob and the band have instead been slotted into the Frequency Festival, St. Pölten, Austria, 16-18 Aug 2012 (set dates/times TBD). 10 May 2012 Put up a performance stills page for the 08 Apr 1983 Hüsker Dü show at the Wil-Mar Neighborhood Center, Madison WI. Thanks to Jennifer Leazer for the use of her photos, and to Murray Kapell, who scanned them and posted the images to his Views from the Pit site. 06 May 2012 Added comments from Vicki R. to the venue info page for the Sherwood Country Club in Indianapolis. 02 May 2012 Upgraded the artwork page for Bob Mould's Workbook album released in the US 23 years ago today. 02 May 2012 Added "811B-39 (L.O.F.)" to the song titles list. Thanks to Frank Campagna for pointing out the omission. 30 Apr 2012 Upgraded the artwork page for Bob Mould's self-titled album on Rykodisc (familiarly known as the "Hubcap" album bcause of its front-cover artwork), released in the US 16 years ago today. 26 Apr 2012 New Bob Mould date announced: 06 May 2012, Haw River Ballroom, Saxapahaw NC (benefit concert to defeat Amendment One). Also featuring David Cross, Stuart McLamb of The Love Language (Solo Set), Tig Notaro, Superchunk (Acoustic Duo), Amber Tamblyn. More info here, tickets can be purchased here. 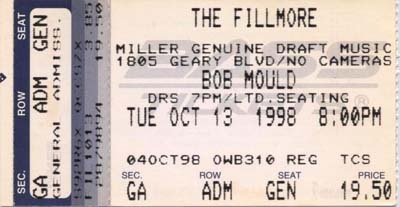 26 Apr 2012 Made some small tweaks to the Live Radio discography entry for Bob Mould's 26 Apr 1991 appearance on Mountain Stage, which aired 21 years ago today. 24 Apr 2012 US Bob Mould Band Copper Blue performance announced: 03 Jul 2012 at Summerfest, Milwaukee. More info here; ticket purchasing options here. 23 Apr 2012 Made some minor updates to the Commercial Video discography entry for Every Everything, Gorman Bechard's documentary on the life of Grant Hart. Also embedded the film trailer. 16 Apr 2012 New Grant Hart date announced: 21 Apr 2012, 2012 Spring Hootenanny, Silver Silver Dome Ballroom, Neillsville WI (2012 Spring Hootenanny). More info here. Also put up a flyer image for the gig and updated the 2012 flyer index page. Thanks to James Lindbloom for the info. 12 Apr 2012 Upgraded the artwork page for the last official Hüsker Dü album, The Living End, released 18 years ago today, thereby fulfilling the Hüskers' contractual obligations to Warner Bros.
Also switched the venue link for the long defunct O'Cayz to its Wikipedia entry, as the club's official site has expired. 09 Apr 2012 Added Grant Hart's show last night at Rose and Kettle (Cherry Valley NY) to the dates page and put up a performance stills page for it. 07 Apr 2012 Added a newly-found Hüsker Dü image (via the Gimme Noise blog City Pages retrospective) to the candid images page. Thanks to Dave Parent for the pointer. 06 Apr 2012 Put up a setlist page for Grant Hart's show last night at Cafe Nine in New Haven. Also added a couple of new entries to the song titles list: "Radiate Away" (seems a safe bet that it's the real title) and "Golden Chain" (a new song from Grant's upcoming album, The Argument, the title of which was supplied by Grant). Thanks to Chris Linehan for the info. 06 Apr 2012 Added a flyer image for Bob Mould's 19 Feb 2012 show at Doug Fir in Portland OR and updated the 2012 flyer index page. 01 Apr 2012 Put up a performance stills page for the 11 Dec 1982 Hüsker Dü house show to benefit Chlidren's Hospital in Minneapolis. 01 Apr 2012 Put up venue image pages for Bluebird Café, Nashville and Lexington Ave Brewery, Asheville NC and linked them to the dates page. Thanks to Jason Murphy for the Bluebird shot. 09 Apr 2012 Grant Hart's shhow last night at Rose and Kettle (Cherry Valley NY) to the performance stills page for it. Also added a venue info page for the Black Lodge, and put up a poster image for tonight's gig there. Thanks to Phil Venable for the info. 30 Mar 2012 Updated the dates page to reflect the cancellation of Grant Hart's scheduled shows in Philly and DC earlier this week (Grant injured his back). Thanks to Phil Venable for the info. 09 Aug 2012, Way Out West Festival, Göteborg, Sweden. Ticket info here. 11 Aug 2012, Paradiso, Amsterdam. Ticket presale 24 March. More info here. Also put up a long-overdue venue image page for Paradiso, and added a Way Out West flyer image to the 2012 poster index page. Thanks to Martin van Rappard for the Amsterdam gig alert. 19 Mar 2012 Another Grant Hart Eastern US spring tour date confirmed: 06 Apr 2012, Cake Shop, NYC. 19 Mar 2012 Added a performance stills page for the 16 Mar 2012 Bob Mould gig at Frank in Austin (SXSW Merge Showcase). Also added an after-show shot of Greg to the Hüsker Dü candid photos page and a Hüsker Düdes poster image to the 2012 poster index page. Thanks to Tobi Severson for the Quenchers photos. 16 Mar 2012 Added a preliminary entry to the Commercial Video section of the annotated discography for the just-announced film project by Gorman Bechard, Every Everything: The Music, Life & Times of Grant Hart and updated the summary discography. More info and a trailer of sorts on the project's KickStarter page. 16 Mar 2012 Grant Hart was just added to the bill at the Dakota Jazz Club in Minneapolis, 26 Apr 2012 (opening for Lambchop). Updated the dates page. Thanks to James Lindbloom for the info. 12 Mar 2012 Put up a setlist page for the 10 Mar 2012 Hüsker Düdes show at Quenchers Saloon in Chicago. Greg Norton made a guest appearance on three songs. Thanks to Hüsker Düdes. 12 Mar 2012 Put up a print ad for the 11 Mar 1984 Hüsker show at 950 Lucky Number in Chicago and updated the 1984 flyer index page. Thanks to Aadam Jacobs. 09 Mar 2012 It was announced today that Bob Mould has signed with Merge Records to put out his new album (already recorded) this fall. Added a placeholder entry for the album to the annotated discography and added it to the summary discography. 09 Mar 2012 Another Bob Mould SXSW gig announced today: 16 Mar 2012 at Frank, as the closing act in the Merge Showcase. 08 Mar 2012 Grant Hart SXSW gig announced: 16 Mar 2012 at Beale Street Tavern. 06 Mar 2012 Bob Mould Band SXSW "Copper Blue" performance announced: 17 Mar 2012 at Mohawk, Austin. Updated the dates page and added a poster image to the 2012 poster index page. More info here. 29 Feb 2012 Titles of two of the new Bob Mould songs have been determined, according to Spin: the song designated as "...make it up to you somehow" is apparently called "The Descent" and "...around the city square" is "Round The City Square." Updated the affected setlists and added the new songs to the song titles page. 14 Aug 2012, Arena Wien, Vienna. Thanks to Rüdiger Höckel for the pointer. 27 Feb 2012 Put up a setlist page for the 24 Feb 2012 Bob Mould Band "Copper Blue 20th Aniversary" performance at Bottom of the Hill, San Francisco (Noise Pop 2012). Thanks to Sumant Ranji. Also updated the list of songs covered to include Cheap Trick's "Downed," which was played as the last encore. 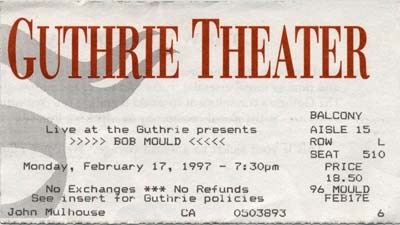 27 Feb 2012 Added a performance stills page for the 17 Feb 2012 Bob Mould solo show at the Triple Door in Seattle. 26 Feb 2012 Updated the venue info page for the Philadelphia Elks Center, where Hüsker Dü played on 08 Feb 1986. Thanks to Ralph Johnson for the info. 22 Feb 2012 Put up a setlist page for the 19 Feb 2012 Bob Mould show at Doug Fir Lounge, Portland OR. Thanks to David Benedetti. 20 Feb 2012 Upgraded the artwork page for the Sugar Whatever Makes You Happy bootleg CD in honor of the 20th anniversary today of the first Sugar show, at the 40 Watt Club in Athens GA.
20 Feb 2012 Grant Hart was unable to appear at the 17 Feb 2012 benefit show after all; updated the dates page to reflect the cancellation. Thanks to James Lindbloom for the update. 17 Feb 2012 Added the address of the long-defunct Fiesta Club in LA to its meager venue description page. 17 Feb 2012 Added the 1992 Rykodisc press kit for the Sugar Copper Blue album to the Press releases collection. 16 Feb 2012 Added a Grant Hart date: house show (Occupy Recruits Benefit)  Friday, 17 Feb 2012, at 3712 Columbus Ave S in Minneapolis. Thanks to James Lindbloom for the info. Also updated the 1994, 1995, and 1996 flyer index pages. 15 Feb 2012 A Grant Hart East Coast date announced: 30 Mar 2012, at The Cave, Chapel Hill NC. Thanks to Phil Venable for the info. 01 Apr 2012 Added a performance stills page for the 11 Dec 1982 Hüsker Dü gig 2922 Lyndale in Minneapolis, a house show benefit for Children's Hospital. 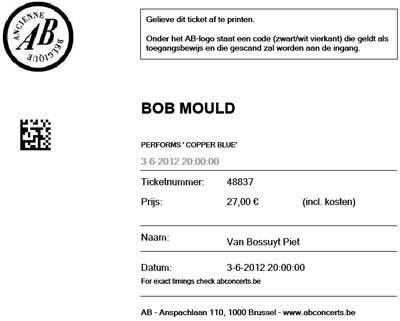 19 Aug 2012 Put up a setlist page for the 18 Aug 2012 Bob Mould Band "Copper Blue/Silver Age" show at Pukkelpop Festival, Hasselt, Belgium. Thanks to Jason Narducy for the info. 18 Aug 2012 Put up a performance stills page for today's Bob Mould Band show at Pukkelpop Festival, Hasselt, Belgium (screencap images from live video stream). The Zagreb show was canceled when Grant was detained at the border. 17 Aug 2012 Put up a setlist page for the 16 Aug 2012 Bob Mould Band "Copper Blue/Silver Age" show at Frequency Festival, Green Park, St Pölten, Austria. Thanks to Jason Narducy for the info. 17 Aug 2012 Previously unlisted Grant Hart gig added to the dates page: 16 Jun 2011, Hell's Kitchen, Tacoma WA (as determined from a flyer image just posted to Grant's Facebook page). Put up a venue description page and a venue image page for the recently-deceased Hell's Kitchen, added a flyer image, and updated the 2011 flyer index page. 15 Aug 2012 Created an entry in the Covers and Tributes section of the annotated discography for Subterfúgio's 1993 cover of "Never Talking To You Again" and updated the covers cross-reference page. Thanks to former band member José Jacinto Santos for the info. 15 Aug 2012 Put up a performance stills page for the 08 Aug 2012 Bob Mould Band show at Øya Festival, Oslo, Norway. Thanks to Jon Wurster and Birger Vikebø for the photos. 14 Aug 2012 Put up a venue description page for the now-defunct Goudvishal, Arnhem NL and added a venue image page. The club's original website still exists in vestigial form, but who knows how long it will be around. 09 Aug 2012 Put up a setlist page for the Bob Mould Band "Copper Blue/Silver Age" show at Øya Festival, Oslo, Norway, 08 Aug 2012. Thanks to Jason Narducy for the info. 08 Aug 2012 Put up a setlist page for the Bob Mould Band "Copper Blue/Silver Age" show at Tavastia, Helsinki, Finland, 06 Aug 2012. Thanks to Jason Narducy for the info. 30 Jul 2012 Put up a flyer image for the 15 Jan 1983 Hüsker Dü show at Minor Rock in Berkeley CA. Added this gig (previously unlisted) to the dates page and updated the 1983 flyer index page. Also put up a brief venue description page for Minor Rock. Thanks to Lasse W. for the pointer. 28 Jul 2012 New Grant Hart date announced: 18 Aug 2012, House of Rock, Eau Claire WI. Gorman Bechard will be on hand to shoot Grant's set for the upcoming Every Everything documentary. More info here. Also embedded the new Every Everything trailer in the commercial videos section of the annotated discography. Thanks to James Lindbloom and Gorman Bechard for the info. 24 Jul 2012 Put up a flyer image for the 21 Feb 1985 Hüsker Dü show at Pine Street Theatre in Portland OR. Updated the dates page and the 1985 flyer index page. Thanks to Lasse W. for the pointer. 22 Jul 2012 Put up a flyer image for the 22 Feb 1982 Hüsker Dü show at Merlyn's in Madison WI. Also put up a Merlyns venue image page. Updated the dates page and the 1982 flyer index page. Thanks to Jay Brown ( jfotoman) for the Cleveland photos and Murray Kapell ( Views from the Pit) for the Madison photos. 15 Jul 2012 Put up a performance stills page for the 03 Jul 2012 Bob Mould Band show at Summerfest in Milwaukee. Thanks to Mary Grant for the photos. 15 Jul 2012 A second Metro (Chicago) date has been added to the Bob Mould Band Copper Blue/Silver Age tour. Two nights now: 13-14 Sep 2012. More info here. Also added a better image of the current site of the former Duffy's in Minneapolis to the Duffy's venue image page. 04 Jul 2012 Upgraded the artwork page for Grant Hart's Ecce Homo album. Note that the cover art is an image of the shirt Grant is wearing in this photo. Thanks to Chris Linehan for that observation. 04 Jul 2012 Put up a performance stills page and a flyer image for the 23 Jun 2012 Hüsker Düdes show at the Turf Club in St Paul. Updated the dates page and the 2012 flyer index page. Thanks to Neza S.G. and Tony Zaccardi for the photos. 04 Jul 2012 Put up a photo of Greg Norton and Terry Katzman at the Turf Club in St Paul for the 23 Jun 2012 Hüsker Düdes show, and updated the candid images page. Thanks to Tobi Severson for the photo. 03 Jul 2012 Put up a setlist page for the 23 Jun 2012 Hüsker Düdes show at Turf Club in St Paul and added the show to the dates page. Greg Norton made a guest appearance on two songs. Thanks to Geoff Greenberg and Hüsker Düdes. 01 Jul 2012 Added a 1994-ish photo of Grant Hart to the candid images page. Thanks to Paula Warner for the scan. 01 Jul 2012 Finally got the Sugar 1993 Japan Copper Blue tour dates straightened out, based on the info presented in this flyer. Added the flyer to the 1993 flyer index page. Added a venue description page for Shibuya On Air, and updated the venue description pages for On Air West, Nagoya Club Quattro, Shinsaibashi (Osaka) Club Quattro, and Shibuya (Tokyo) Club Quattro. Thanks to Malcolm Travis for the info and loan of the flyer. 01 Jul 2012 Added a newspaper ad image (from the Flagpole, Athens GA weekly arts paper), for the first Sugar show, 20 Feb 1992 at the 40 Watt Club in Athens, and updated the 1992 flyer index page. Thanks to Malcolm Travis for the loan of the clipping. 01 Jul 2012 New Bob Mould date announced: 02-04 Nov 2012 (exact schedule not yet finalized), Auditorium Shores, downtown Austin (FunFunFun Fest). 14 Feb 2012 Added a couple of 1996 images of a backstage meeting between Bob and Grant to the Hüsker Dü candid photos page: I'd been looking for these for a long time, and recently stumbled upon them while sorting through piles of old papers in a de-cluttering effort. A rare post-Hüsker encounter. Thanks to John Mulhouse for all the scanned images. 14 Feb 2012 Added an early 90s caricature of Bob Mould by Kerry Waghorn to the Hüsker Dü art images page. 14 Feb 2012 Added the 1994 Warner Bros. press kit for The Living End to the Press releases collection. 13 Feb 2012 Put up a setlist page for the 04 Jul 1997 Grant Hart Entry show. Thanks to Scott Turner. 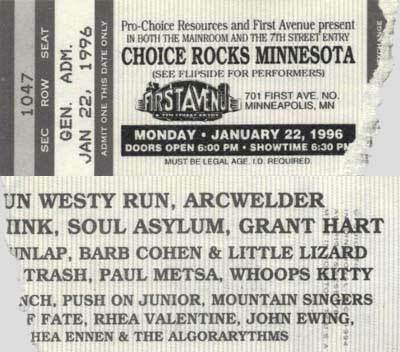 11 Feb 2012 Added a prviously unlisted Grant Hart gig to the dates page: 04 Jul 1997, at the Entry in Minneapolis. Thanks to Scott Turner. 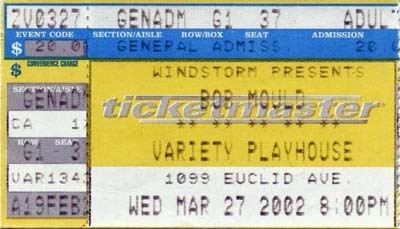 Also added an image of the 08 Feb ticket stub to the ticket collage page. 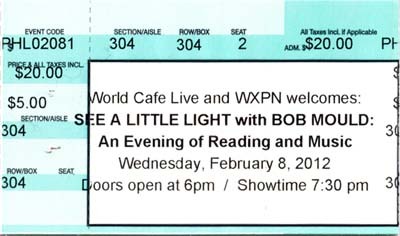 Bob + band (Jason Narducy, Jon Wurster) to perform all of Copper Blue front to back. Tickets on sale Friday, 10 Feb.
25 Jan 2012 Corrected the annotated discography entry for the Sugar Gee Angel CD EP to reflect the fact that it was packaged in a jewel case with insert. Thanks to Simon Way for spotting the error. 22 Jan 2012 Added a new Bob Mould caricature (from Boston Rock, 1984) to the artist renderings page. 22 Jan 2012 Added the Jan 1985 SST press kit for New Day Rising to the Press releases collection. Having decided to include all the materials in each press kit, added the photocopied press clippings to the Warehouse: Songs And Stories page. 19 Jan 2012 Added "Bad Street, USA" by Michael Hayes and the Fabulous Freebirds to the list of songs covered by Hüsker Dü. It appears on a 1984 video of a basement show in Minneapolis that I have not yet gotten around to documenting, but have posted in segments to YouTube. Thanks to "skinheadkyle" on YouTube for identifying the song (which appears in segment 2). 18 Jan 2012 Began work on a Press releases collection, accessible via the slightly revamped Ephemera page. First up, the Mar 1986 Warner Bros press release for Candy Apple Grey and the Jan 1987 Warner Bros press release for Warehouse: Songs And Stories. 13 Jan 2012 Added a performance stills page for the 23 Sep 1985 Hüsker Dü show at Stow Hill Labour Club (Newport, Wales). Thanks to Matt Gray for the photos and to Martin Bowen-Jones for the pointer. 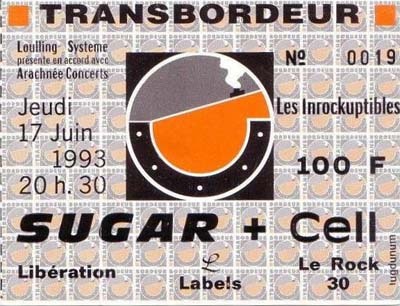 13 Jan 2012 Added a previously unlisted Sugar gig to the dates page: 17 Jun 1993, Le Transbordeur (Lyon, France). Also put up a venue image page for Le Transbordeur and added a scan of the ticket stub for the show to the ticket collage page. Thanks to Pierre Chavent for the info and images. 12 Jan 2012 Added a performance stills page for the 30 Nov 2011 Grant Hart show at Mono in Glasgow. Thanks to Mike Melville. 11 Jan 2012 Bob Mould to appear at Noise Pop 2012 with bandmates Jon Wurster and Jason Narducy to perform Copper Blue in its entirety at Bottom of the Hill in San Francisco. Updated the dates page and started checking flight schedules. 10 Jan 2012 Put up a setlist page for the 21 Mar 1986 Hüsker Dü show at the International in Manchester (UK), based on a recording I hadn't seen before that turned up recently on one of the torrent sites. Also added an entry describing the recording to the annotated discography. Thanks to Jim Elliott. 08 Jan 2012 Added an entry to the annotated discography for the previously unlisted Garage D'Or Christmas 1998 cassette compilation (two live instore Grant Hart songs), put up a artwork page for it (using images from GoJohnnyGo.com), and updated the summary discography. Also upgraded the artwork page for the Garage D'Or Christmas '99 cassette. 08 Jan 2012 Added a revised setlist for the 17 Mar 1986 Hüsker Dü show at Liverpool University, based on a more complete recording (four tracks not previously listed), and added some explanatory notes to the recording description in the annotated discography. Thanks to Jim Elliott. 02 Jan 2012 Added a setlist page for the 28 Aug 1985 early show at 1st Ave. This was the 4pm all-ages show on the same date as the show recorded for the Spin Radio Concert, which was the later performance. Also added a separate entry for the early show to the dates page, which should have been done a long time ago. Thanks to Jim Elliott. 01 Jan 2012 Added a performance stills page for the 15 May 1993 Sugar show at the Hollywood Palladium. Thanks to Eric Rife. 01 Jan 2012 Added an entry to the annotated discography for Grant Hart's recently released So Far From Heaven 7" and put up an accompanying artwork page. Also added a placeholder entry for Grant's album, The Argument, scheduled to be released in 2012 (from which the two tracks on the 7" were taken) and updated the summary discography.